Kernel 4.15.0-45, guest on Server 2012 R2 Hyper-V Host also affected. Confirming for both 4.15.0-44 and 4.15.0-45 on Windows Server 2012 Hyper-V. For now I've forced GRUB to boot 4.15.0-43. The guest is Ubuntu Server 18.04.1. FWIW, the VM has 2 virtual cores and dynamically-allocated memory of up to 6144 MB. I'm only able to view the boot process in Hyper-V's "Virtual Machine Connection" console, which has no scroll buffer. When boot failure occurs, I can see the last few lines of an error trace in the console, but I've been unable to capture the full trace. No information regarding the boot ends up in the system logs--i.e., journalctl doesn't recognize the failed boot attempts at all. I'm unable to reboot the faulty server to try to obtain any information on the crash, but creating a brand new instance of 18.04 LTS on Hyper-V 2012 R2 boots quite happily on 4.0.15-45. I've also noticed that I haven't installed the azure tuned kernel package linux-azure. Comment #14 refers to an incorrect kernel version, it should be 4.15.0-45, sorry for the confusion. Does the problem happen in a gen1 or gen2 VM? The original report would have to be gen 1 since Rene is using Win Server 2008. Since Graham is on 2012 R2, perhaps he can confirm whether his VMs (both the failed one and the newly-created working one) are gen 1 or 2. 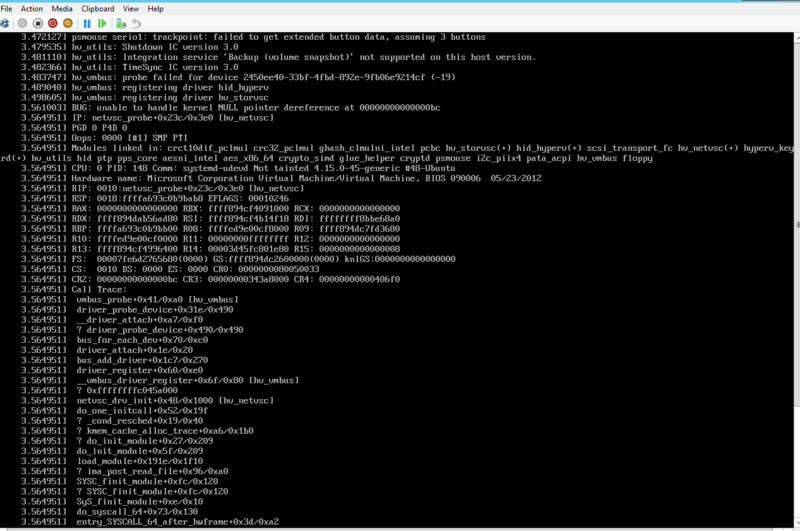 I also can confirm that the kernel 4.15.0-44-generic and -4.15.0-45-generic doesn’t boot in MS Hyper-V 2012 R2. Older kernels 4.15.0-29-generic and 4.15.0-43-generic are ok.
As commented by others it is not possible to scroll back on the Hyper-V’s virtual console nor capture text from the virtual console. Poor reporting on my part, the original failure (#12) was on 2012, so is a Gen 1 VM. The subsequent test (#14) was on 2012 R2 and was using a Gen2 VM. Sorry for the incorrect reports, I'll try to test on the original host with a new instance. I installed a new instance on the original Hyper-V server, so 2012 with Gen 1, 2 CPU, 1GB RAM. 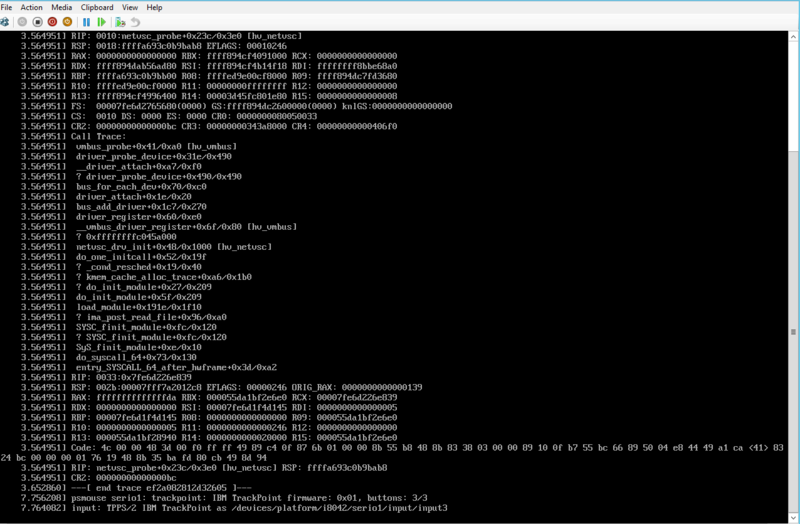 I managed a partial screen image of the stack dump on boot. I don't have a Win Server 2012 machine available right now, but I have a Win10 Pro machine with Hyper-V and I was able to boot 4.15.0-45 on a gen1 VM. Do you think there's any other specific VM configuration that you are using? I will try later with gen2. No special config, used the Hyper-V wizard to create the VM, 2 CPU, 1024 MB RAM, 127GB HD, booting off 18.04.1 ISO. Gen 1 for me also, I run on Server 2012. Windows Hyper-v Server 2012, Gen1 Hyper-v, same problem. Cannot boot 4.15.0-44 and 4.15.0-45 kernels. The last that works for me too is 4.15.0-43. Just rebooted after updating Ubuntu server 18.04 and discovered that problem. Having the same problem on Windows Server 2012 (build 9200) Hyper-V with linux kernel versions 4.15.0-44 and 4.15.0-45. Last known working kernel version 4.15.0-43. 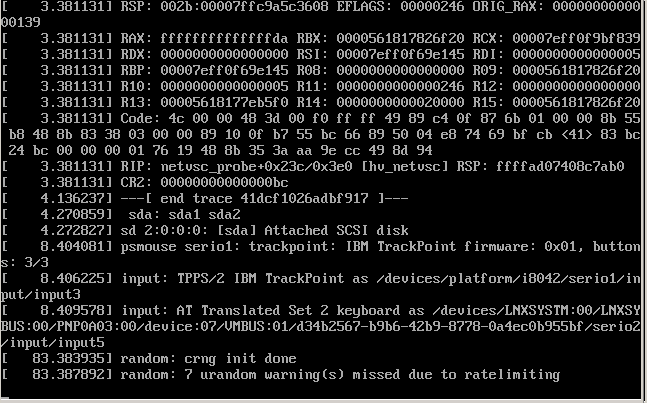 Attached is a screenshot of kernel panic stack trace. I can confirm that that HWE kernl based on Linux kernel 4.18.x works fine on Hyper-V 2012 R2 (Gen 1) virtual machines. I discovered this when I tried to install the 18.04.2 ISO and it had the same problem, but when I tried to install 18.04.2 with HWE kernel it worked. I have now installed the kernel provided by the package 'linux-virtual-hwe-18.04' on our virtual machines. This has allowed us to receive security updates on the virtual machines affected by this bug. Probably caused by LP: #1807757. I tried that kernel but it didn't seem to make any difference. Version 4.15.0-46 from the repository was already installed so I had to uninstall that one first. Is it possible to collect dmesg? Boot with latest Ubuntu kernel with kernel parameter "blacklist=hv_netvsc modprobe.blacklist=hv_netvsc", then run `sudo modprobe hv_netvsc`. Kernel parameters are as you requested and a modprobe hv_netvsc after boot. I'm not sure exactly how to retrieve dmesg properly nowadays but I used journalctl -k -b -2 to retrieve the kernel messages for the boot we're interested in. If you need more detailed info give me a hint on how to retrieve it. Is it possible to remove the kernel I built, and use the one in ubuntu archive? Then please use dmesg instead of journalctl, thanks! https://people.canonical.com/~khfeng/lp1814069-2/ is working for me. I haven't done any extensive testing but the server can boot and has network access. https://people.canonical.com/~khfeng/lp1814069-2/ this working for me. My server booting and has network access. So if this was committed 3-28 we can expect an update on May 13th? Is that correct? I'm satisfied, anyone else test this? I have also installed linux-image-4.15.0-48-generic/bionic-proposed and it's working fine for me as well. Patchset has already landed in Cosmic / Disco, marking the linux package as fix released.